The Rock the World Network is a community of uncommon givers. The Uncommon Giving show features the leaders of charities, foundations and corporations rocking our world. Chicke Fitzgerald interviews Bruce Beckham. The original live interview was on 11/30/2012. This episode is #57 of all time in the top 100 shows on Solutionz Live! 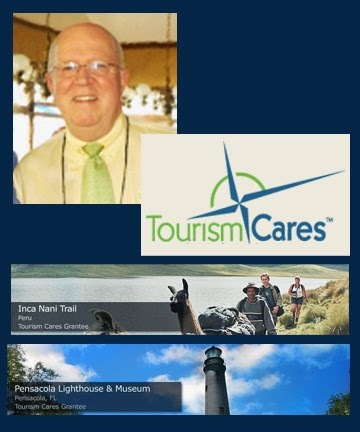 Bruce Beckham is the executive director and CEO of the travel industry’s premier non-profit organization, Tourism Cares. He is a Certified Tourism Professional, the former owner of a travel agency and packaged tour company and a former president of the National Tour Association (NTA). People travel for many reasons - to learn about old and new cultures, to experience new places or even to revisit favorite destinations. Travel and tourism professionals who appreciate and enjoy the wonderful treasures the world has to offer want to make sure these places are here for their grandchildren. That is why Tourism Cares exists - to preserve the travel experience for future generations. We award grants to non-profits around the world, provide scholarships to the future workforce of travel, tourism and hospitality, and organize tourism industry volunteer events so we can stop saying "there used to be." Now in its tenth year, Tourism Cares volunteer activities have marshaled more than 3,500 volunteers donating nearly 30,000 service hours at a value of more than $500,000 in donated services and on site restoration assistance to sites such as New York’s Ellis Island, New Orleans, the Mississippi Gulf Coast, Mount Vernon, Gettysburg and Alcatraz Island.